Fall comes very early here in Maine. It always catches me by surprise, because I grew up in upstate New York, where fall arrives in October and could easily continue straight through Thanksgiving. It's not until Halloween that I usually realize it's time to go hunting for apples and by then the pickings are slim and the scenic foliage is long past it's prime. But this year I'm determined to make it before candy corn has disappeared from the shelves. 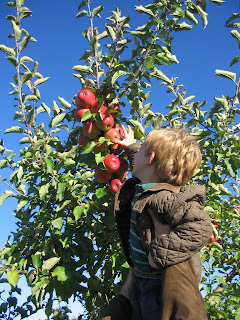 Ricker Hill Orchards in Turner, Maine is our favorite place for apple picking. It's a trek to get out there, just over an hour driving time from Portland, but we load the boys into the car with a pile of books and it makes for a nice weekend drive. It's totally worth it for Ricker Hill's organic orchards, corn maze, obstacle course, farm activities, and of course apple cider donuts. The pick-your-own orchards are up a long dirt road past the farm. You'll wind through orchards, past the cranberry bog (again, we're always too late to see the cranberry harvest and it just looks like a big muddy field) and to the top of the hill where the view is spectacular, foliage or not. 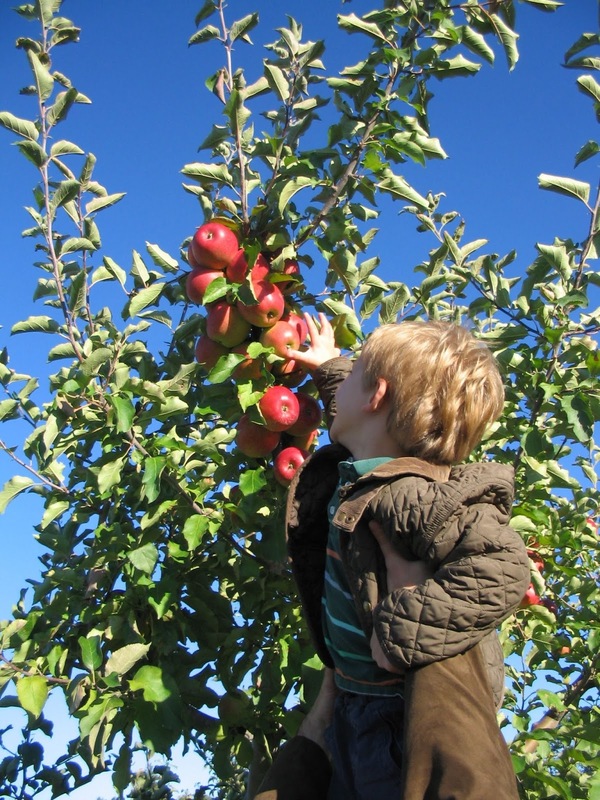 There are wagons for the kiddos to pull their haul along (or usually it's us pulling them) and after paying for your bags (organics are extra) off you go into the orchard. It's divided into three sections, non-organic and organic with a "semi-organic" row or two separating them. 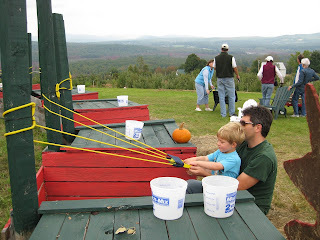 The biggest hit of the day is the apple sling shot, where you pay for a bucket of rotten apples (genius, from the farmers point of view) and then you can have at it till your bucket runs out. They make such a satisfying splat no matter where they land. After a few rounds its back down to the farm to try the bouncy house, corn maze, hay climb, and obstacle course. All the activities are extra and you pay at the shop while you're picking up a bag of hot cinnamon sugar donuts and gallons of cider. If you're feeling lazy and don't want to venture past Portland, you can pick up Ricker Hill organic apples and cider at Whole Foods and Hannafords. Just make sure the kids wait till they get home to start sling-shotting their apples. * writing ended up on the back burner yesterday when I realized none of the little C&Gs sports equipment fit. How I didn't figure this out in the past four weeks, I really don't know . . . but with school activities starting up this week it's really time to snap out of my end-of-vaca denial!